My trip to the Adirondacks was a great success. The lodge was comfortable. DH and I got to spend quality time with friends that live quite far away. We hiked, did some rafting and some canoeing. There also was quite a bit of knitting and spinning and even a trip to the most amazing store. Old Forge Hardware is quite the general store: you’ll find hardware stuff, camping and fishing gear, kitchen equipment, decorations, clothing, a bookstore section, furniture and even a knitting section. My friend and I were quite impressed by the selection of books, yarns and accessories there. If you’re in the area it would definitely be worth the visit, if only to visit the store itself. Also, if you’re ever in the area there is another stop you must do. 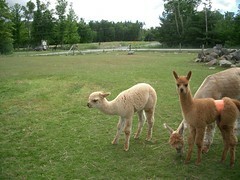 In North Creek, on route 28, there is Gore Mountain Alpaca Farm. 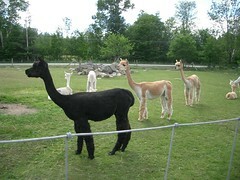 The owners are extremely friendly and will talk about their alpacas and let you go into the field with the alpacas and even touch them. I had a great time there and would have loved to stay much longer. 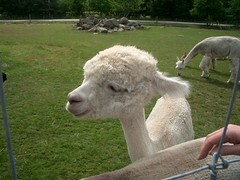 The alpacas had just been sheared a couple weeks ago and were super cute. The group that you see are about a dozen females with the two babies. About 4 of the females were pregnant and are expecting this year. If you want to get more information or see more pictures just let me know. Tomorrow pictures of what I knit and spun while on vacation!